Giaja himself was an inspirational role model for numerous young investigators. He was particularly notable for his encouraging statements and demonstrated by personal example that important discoveries do not have to be the privilege of large and rich countries. In spite of several wars (Balkan wars, WWI and WWII), Jean Giaja established an extraordinary carrier working in Yugoslavia for a total of 47 years. His work was highly cited and still is even 30 years after his death. Most importantly, his work established a school of followers that took his great legacy and brought it even further recognition from the international scientific society. A few senior investigators joined Prof. Djaja in his work on hypothermia, including Drs. Branimir Males and Stefan Gelineo. Several students also joined the group and established successful university carriers in Belgrade and elsewhere, including Drs. Vojin Popović (Former Chair of the Department of Physiology, Emory University, Atlanta, Georgia), Leposava Marković-Djaja (University of Belgrade, Belgrade), Radoslav Andjus (University of Belgrade, Belgrade), Vojislav Pavlović (University of Sarajevo, Sarajevo, Bosnia) and Vojislav Petrović (University of Belgrade, Belgrade). Among them, Stefan Gelineo (Djelineo), as a lifetime collaborator, and Radoslav Andjus and Vojislav Petrović, as Giaja’s successors, were the most responsible for the successful continuation of the growth and development of Belgrade’s School of Experimental Physiology and for establishing departments of physiology in the former Yugoslavia at large. We will end this article with a retrospective of these three followers of Giaja’s legacy. Unquestionably, the most significant results of Professor Andjus’s career are those achieved in his early studies on deep hypothermia, suspended animation and resuscitation. Previous studies in his group showed that 15°C marks a turning point in the physiology of the rat. At 15–20°C, animals exist in a state of cold narcosis in which hypophysectomy and other major operations can be performed (Djaja and Andjus, 1949). After cooling below 15°C, animals were unable to re-warm or to spontaneously increase their oxygen consumption. As a young graduate student, Andjus was the first to resuscitate rats with a colonic temperature between 0 and 2°C even after heartbeat and respiration had been arrested for 40–50 minutes (Andjus, 1951). Previously, rewarming was usually performed by transferring the cold animal to a warm environment. Andjus’ technique instead reestablished circulation by applying heat locally to the cardiac area (by applying a hot metal spatula to the chest wall) and giving artificial respiration before re-warming the whole body. During his postdoctoral studies in the United Kingdom, Andjus and Smith improved this methodology using a focused beam of light to reestablish the heartbeat, combined with artificial respiration. The authors also observed that spontaneous breathing was resumed in the majority of animals when the colonic temperature reached approximately 15°C and after the neck had been heated. Only then were the reanimated rats transferred to a warm bath (Andjus and Smith, 1955). Complete recovery and long-term survival in 80–100% of the animals was also obtained using microwave diathermy for resuscitation. This technique was introduced to avoid the burning of peripheral tissues that occurred with the two other techniques (Andjus and Lovelock, 1955). 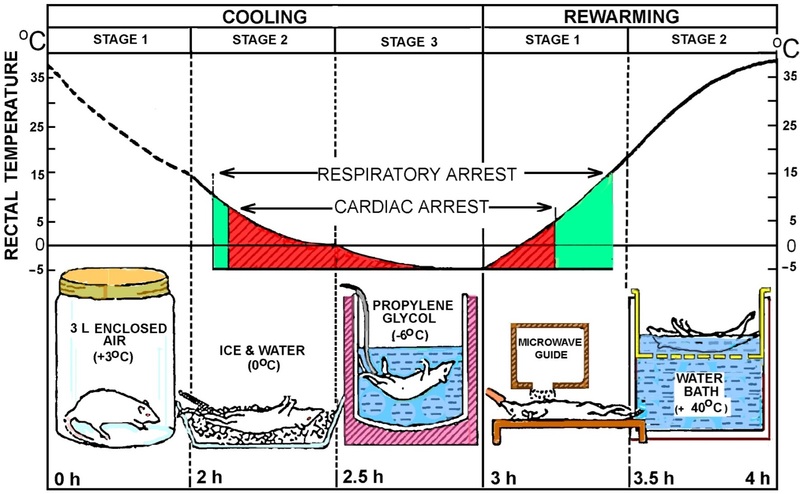 Once this method of reanimation was established, Andjus investigated a number of related problems, including the maximum duration of suspended animation, the effects of repeated cooling to zero, and the possibility of reanimating rats cooled to subzero temperatures (Andjus, 1955). The brain metabolism experiments that Professor Andjus carried out in the early 1960s established an excellent basis for subsequent investigations in the field of neurobiology. He developed a relatively simple isolated, perfused rat brain, with preserved spontaneous and stimulated activity. This was achieved in rats, which are adequately anesthetized by deep hypothermia without the use of any chemical agent. The preparation was perfused with an artificial blood by means of a small roller-type pump. Spontaneous electroencephalographic activity was preserved in isolated brain preparations and persisted for 5 hours. Using this preparation, he also investigated the effects of pentylenetetrazol and loud sounds on electroencephalographic activity and glucose consumption. This work significantly influenced investigations in the field, as documented by over 220 citations by his colleagues (Andjus et al., 1967). The remarkable time-resolution enhancement by deep lethargic hypothermia (15 degrees C rectal temperature, “cold narcosis,” “anesthesia by internal cold”) of metabolic events in the rat brain after oxygen deprivation has been exploited to monitor metabolic changes by in vivo (31)P-NMR. A correlation was established between the bioenergetic status of the brain and physiological descriptors of tolerance (survival and revival times) determined in parallel experiments with large series of animals. Spectral peak integrals were transformed into absolute concentrations by comparison to biochemically determined time series of data obtained in freeze-trapping experiments conducted under identical conditions. 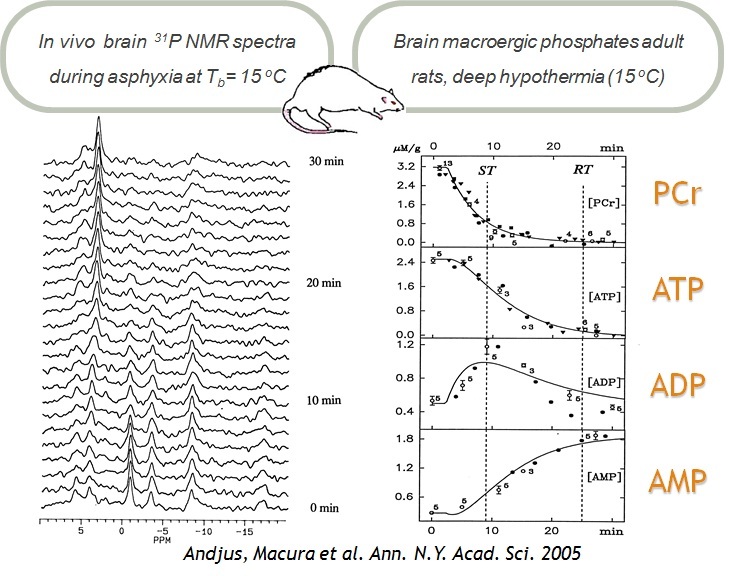 Serial spectra were used to reconstruct the time-course kinetics of intracellular brain pH and of concentration changes of inorganic phosphate, phosphocreatine, ATP, and ADP. Both the biochemical and NMR time series of data were simultaneously fitted by a set of exponential kinetic equations accounting for relationships imposed by the Lohmann and adenylate kinase reactions. Depletion profiles were then computed for a number of descriptors of brain energy status (energy charge, phosphorylation potential, total adenylate, and primary energy stores expressed as the sum of high-energy phosphate-bond equivalents). The results contribute to the understanding of the role of brain energetics in tolerance to oxygen deprivation.